I know many people cringe at the the word tuna, thinking of the canned variety with the happy little fish on the can, especially when I mention it in the same sentence as pasta. But this tried and true recipe has been my “go-to what the heck” can I make last minute recipe for years. The combination of the tuna along with the tomato and balsalmic vinegar just sings with deliciousness. When we lived in Italy I often saw Tonno or tuna in many dishes, even on pizza with hard boiled eggs! 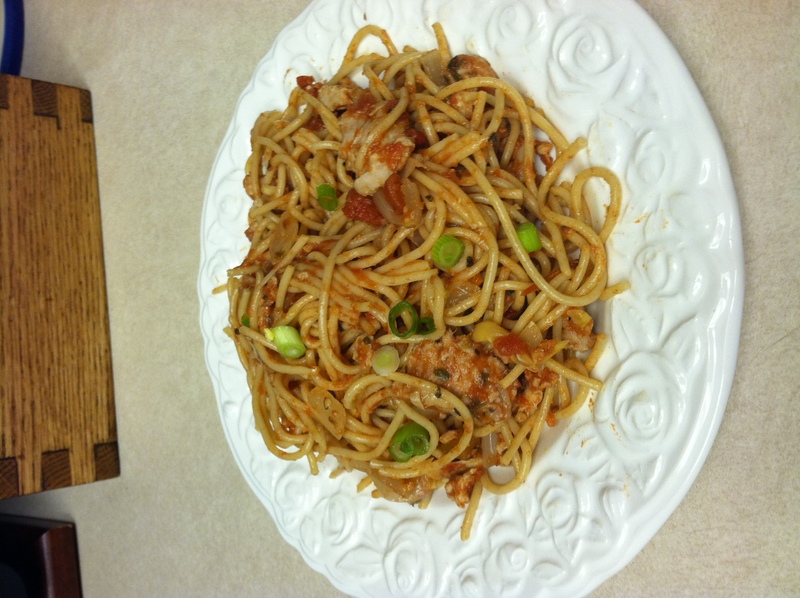 My mom taught me to make Tara’s tuna vermicelli at a very young age and I would often make it afterschool to have dinner ready when she got home for work. I have fond memories of this recipe as I think along with my mom’s greek chicken one, it is one of the first things I really cooked on my own. Initially I made it with a can of tuna and then the vacuum sealed pack but lately I have been using one fresh tuna steak to make it. First saute one small onion that is chopped up in olive oil, add garlic. Add fresh mushrooms to the onions to cook for a bit, if I have them I add artichokes to add more veggies. After the onion is cooked through and translucent add tomatoes, basil, parsley, salt and pepper. Let this simmer for a bit and add Balsalmic vinegar (I have to admit I am a huge fan so I often add quite a bit more and I don’t measure). Then add the pack of tuna or if you are using a fresh tuna steak add that (I usually cook it in a separate fry pan to get it medium). Let the sauce simmer for about 5 mins so the flavors come together. While your sauce is cooking get your pasta ready. You can use vermicelli or any pasta. I like to scoop the pasta out of the hot water and add it directly to the sauce for maximum flavor and also some of the pasta water adds nice flavor to the sauce. Top with grated Romano cheese and cracked fresh black pepper and enjoy. Yes it is a sin in Italy to put cheese on seafood (I know Scott Conant is gonna get me) but I like to live on the edge! Just wait until your taste buds get a sample of this incredible dish, you won’t be disappointed!